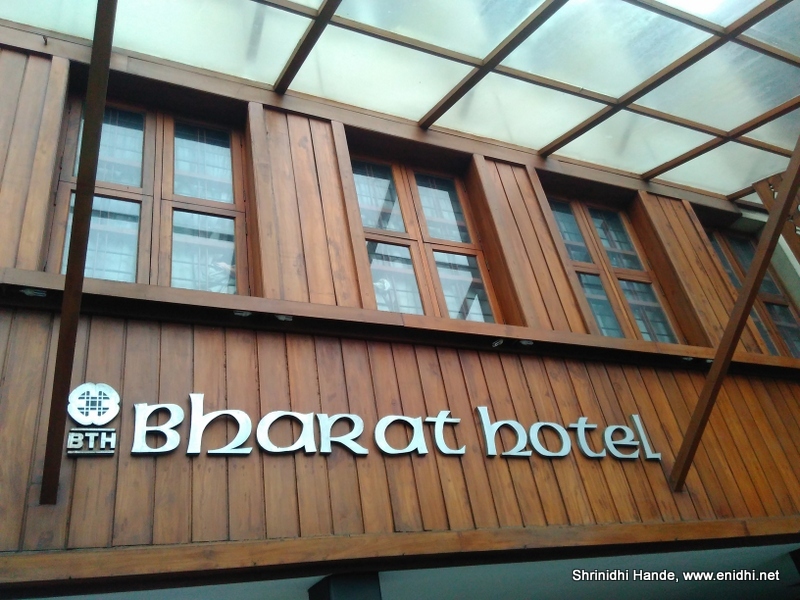 Bharat Hotel, formerly known as BTH or Bharat Tourist Home in Durbar Hall Road, Kochi is where I spent two nights during my latest Kochi weekend trip. This post shares by observations about the hotel based on my stay experience. Bharat Hotel came heavily recommended by friends and relatives mainly because of its pure veg restaurants which are hard to find in Kerala. Because of this, I didn't bother studying other hotels in town and decided that we will try out Barath Hotel. As usual I booked via StayZilla, but this time after comparing all other sites. I was looking for 2 night stay with double occupancy, Non-AC room. On Hotel's own website, this costed Rs 2302 per night all inclusive. Go Ibibo had much better net rate- claimed 60% off, but their process was complicated- for 2 nights, I was required to pay some Rs 6900+, after my check out they would credit back about to 5000 worth credit to my GoIbibo account, where needs to be used for some future booking via GoIbibo (#GoKarde discount coupon)- the rates were for AC rooms and seemed inflated compared to other sites, so skipped it. Oyo didn't seem to have this hotel listed. Finally finalized on good old StayZilla for about 3830 for 2 nights or Rs 1900+ per night all inclusive. Single occupancy would be about 600 Rs cheaper and AC room would have costed Rs 600 more per night. There are cheaper hotels in town. Bharat Hotel offers 24 hours check-in/check-out, which is great- I could check in on Friday night, check out on Sunday evening for 2 days rental. Lots of hotels enforce a 12 noon to 11 AM policy which restricts our usage. At Bharat hotel, 24 hours from Check-in time is counted as one day. You can arrive at 6 AM and check out at 6 AM next day for 1 days rental- most other hotels require you to book for 2 days in such a scenario. Rooms are spacious. Lobby and common areas are spacious too. Doors have manual key, not electronic key card. No mini fridge in rooms or additional accessories like coffee maker, iron etc. Kempi Restaurant has an open area, called Children Park. Bharath hotel seems to be keeping a drum full of butter milk and few glasses on the roadside for general public, for free. Very kind gesture by the hotel, though many were misusing it- filling up large water-bottles with the buttermilk etc. On Friday night and Saturday morning it rained a bit and weather was pleasant, so Non AC room was fine- I opened windows and got cool breeze. On Sunday temperature was very high and fan was struggling to give some comfort. Overhead tanks also heated up so much, all taps would give hot water. I think it is problem everywhere, not just this hotel. Take bath early as there is no cooling system for water. Bharath Hotel is written on top of the roof of hotel. So if you are expecting a helicopter rescue, it will be easy for them to locate you I guess. Centrally located- Railway station/Ernakulam South, Marine Drive etc are within 2-3km from hotel. Subhash Park, Hanuman temple, a laser show venue etc exist within walking distance from Bharath Hotel. Breakfast complementary. Buffet Lunch costs Rs 275, Buffet dinner costs Rs 225. Ala-Carte options also available. Only 1 water bottle was given for double occupancy, which was not adequate. Will be good if they can include one water bottle per person per day, since double occupancy is charged extra. Room Service took time- more than 30 minutes and 2-3 calls to get one water bottle. It is a large hotel with 100s of rooms- don't expect much of personal service. Reception and most common areas are not air conditioned. Restaurant gets lots of visitors during lunch and dinner time- finding parking space will be tough even if you are a resident. Hotel parking is not spacious enough for large buses. Reception tried to bill me 50 Rs for the free water bottle I should be getting for Day 2. They obliged once I brought it to their attention. Ola cab from Airport to hotel costed Rs 600 at 10 PM. Detailed information. Useful for travellers. Nice review. I love their vegetarian sadhya.